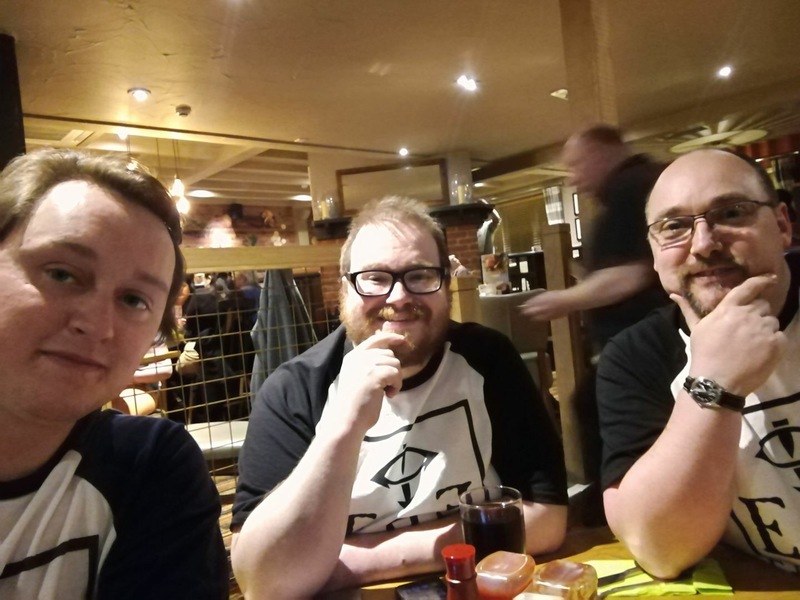 I spent this last weekend at Blood and Glory, the Bad Dice Podcast tournament weekend in Derby, where I was gophering for Greg Dann of The Imperial Truth who was running the Horus Heresy event. It was a really well put together event and Saturday was a lot of fun to help with, I saw some amazing armies and the venue was amazing. When we arrived on Friday we popped into the venue so we could set up the scenery I had brought down to help out with and then I spent time watching the Shadespire games that were going on, as I resisted buying myself a starter set. That really is an amazing game, and I love playing it, just need to get my own stuff for it now! Then we attended the seminar with Games Workshop where we heard about some of the stuff that’s coming up from the studio and we got to see the first reveal of a few cool things which you can read about here. So back to Saturday and it was a great day, Graham got to play against Thousand Sons first, and of course they had Sekmet Terminators and Magnus, it was a hard fought game, and Graham may have danced when he killed Magnus, but the joy was short lived as he lost the game on kill points. After that game I was less focused on Graham and Chris as I watched some of the other games, answering rules queries and being the beat gopher I could be. I saw some brilliant armies, and I have decided that I absolutely want at some point a Custodes army, seeing the models all painted up, well they were just beautiful. I also had a chance to see behind the scenes of Warhammer TV and talk to the guys with Warhammer Community who I was surprised to hear, know who me and Graham are and listen to our podcast! We had a good chat about Company of Legends and what we can do to really take it to the next level and they have encouraged me and Graham to try some live streaming of games, about which I will talk a bit more later on. Saturday night, after which Graham and Chris both ends up with 2 wins and a 1 loss each, we went to the Harvester, which was quite nice, I had a Peri Peri Chicken Burger, which strangely had avocado in it! On Sunday I had to step up and play, my Ultramarines became traitors because the Emperors Children player had been true to his Legion and overindulged! So I played two games, the first was against the Salamanders which I lost 17-2 because his list was tough as nails with it based around a big ten man unit of Firedrakes. My second game was against Robert Ing from Yorkshire Heresys Space Wolves, which I lost a more respectable 8-5, and I have to say that game was one of the most fun games I have had in a long long time. It was brutal, but at the same time amazing fun, and I got to see how powerful the Sicaran Arcus could be, glad I have one of them! Rovers army also won beat pained, a well earned prize and it really was a beautiful army to play against, I wish I could be so talented. And Chris won best Loyalist as well, so he go to take home a big trophy. All in all, the weekend was amazing and although I was left shattered and unable to function for a couple of days afterwards, it was well worth it and I will certainly be back again to help it next year. You can read Greggs write up about the weekend here. So after my conversations with Warhammer TV and Warhammer Community I am experimenting with some live streaming over Twitch and YouTube, it’s just proof of concept stuff to see if we can do it, but so far so good. The OBS software is pretty simple and easy to use and the Restream.io service easily puts out the videos simultaneously on Twitch and YouTube. So I have made a few adjustments to the studio, in the first couple of videos I have done I had to have my studio condenser Microphones front and centre to get audio in as the lavalier microphone I have doesn’t work when plugged into the mixer, works dim when plugged into the audio recorder and the camcorder but not the mixer. Anyway I have since put away my second MXL 990 and in its scissor stand I have placed an Audio-Technica ATR-55 shotgun condenser microphone, which allows me to film with no visible microphone on the screen, the downside is that the microphone has to be in tele mode and the gain cranked all the way up to 11. Anyway I am going to continue experimenting and for games day on Sunday I am thinking of live streaming one of our games to put the technology to the test properly. For day nine which is as I mentioned yesterday and important number to Bahá’ís I wanted to mention another important number, and that is 95. Why 95, well each day a Bahá’í will recite the phrase Alláh-u-Abhá (الله أبهى) which in Arabic means God is the Most Glorious 95 times. The phrase itself is often used as a greeting or saying farewell and I have often heard it said that it is the Bahá’í equivalent of Allah u Akbar. Different Bahá’ís use different methods to count their 95, some count their knuckles 19 times, others use prayer beads, whilst others still use chants. Myself I use technology and have an app that counts my 95 for me as I tap on the screen of my phone. I like to say my 95 before I go to sleep, I find it very calming, the practice itself helps Bahá’ís to focus on obedience to God and spiritual growth and is something that helps to unify the community through a shared ritual. Before I went off the Blood and Glory I finished the last couple of models I needed to paint for my Ultramarines Breacher list. The first being a Preator which is built from the 2011 Games Day MKIII Boarding Marine, which was a wonderful model to paint, and in it you can see the influences that would eventually go into the Breacher and MKIII kits for the Horus Heresy. And to follow that up I finished the two Land Raider Proteus which will transport my Breachers, one of which I tried to make stand out a little as it will eventually transport some Suzerains so I used some of the decals from the Warhammer World Exclusive Command Tanks. I couldn’t sleep a few nights ago so to try and burn off some mental energy I went up to the studio and built the squad of Destroyers I bought recently and a Sicaran Punisher. I decided to get cracking with my Blades of Khorne and began work on my Daemon Prince, obviously with me playing Word Bearers in Heresy this will be useful for that as well. I have the skin all done, and have gotten the rest of the base coats on and it’s just been washed tonight so the next step will be some highlights. I haven’t picked up my book at all this week, I keep meaning to but then I fall asleep or get distracted, must try harder. I have finished listening to Path of Heaven, and the conclusion to the story kind of snuck up on me, I forgot how quickly everything comes together. And I have now started on Praetorian of Dorn, a book that totally changed my opinion on John French. Before this I viewed him as a decent author, but never one to produce works that would knock me off my feet, but this book, this book is something else and has made me totally reevaluate his body of work and realise that he actually has been producing amazing works, and it was me who couldn’t see that. Anyway I have listened to about half the book now, and I am really enjoying it. Apart from the two game of Horus Heresy I haven’t played anything else this week. I have noting being backed right now, although the Ogres Miniatures set 2 launches next Monday and that will be quite tempting. I did get Gloomhaven delivered today, and that’s a huge box, 9.9kg worth of game. Me and Megan punched the boards today and it’s all in really good condition, unlike some of the earliest copies ours came through perfect, I also have the removable stickers and I can’t wait to get this mammoth game to the table. This week I cooked my Italian Winter Soup, which is a reasonable basic soup, with the standard base of celery, carrot and onion found in the best soups. To which I add tomatoes, green lentils, bacon lardons, Italian herbs and orzo. It’s such a simple yet deeply delicious recipe, and one that I feel pleased to have put together, goes delicious with bread fresh out of the oven. A few more bits and bobs for the podcast were purchased this week, I got a 3.5mm to USB cable for the XM8500 so we could take it on the road to Blood and Glory which was very very helpful. I also needed a mono to stereo converter for my shotgun microphone after realising it picks up sound in mono only! We also purchased the set of Behringer XM1800S which we will be using when we take the podcast on the road and to the Heresy Weekender, and to go along with them we got our next pair of Audio‑Technica ATH M30Xs which now means when we borrow Lindsay’s pair we have a full set up for podcasting with four people now. Oh and I purchased a cheap second hand Logitech C920 for us to experiment streaming with, I already have a Logitech C920-C so this will add a second angle for the streaming, just need to get a tripod for it now.